Joseph Person of the Charlotte Observer says Carolina Panthers will likely wait on a potential extension for defensive interior lineman Star Lotulelei until after the coming season. Person went on to say Lotulelei’s future with the team at large is dependent on the play of 2016 first round pick Vernon Butler. Lotulelei became an instant starter for the Panthers after being draft in the first round of the 2013 draft. In the four seasons since being drafted, Lotulelei has piled up 2402 total snaps. Lotulelei had a good start to his career, earning a grade of 81.3 (31st among DIs) as a rookie and a grade of 80.4 (36th among DIs) in 2014. However, he has seen his play drop off considerably since. His 2016 grade of 46.9 ranked just 75th out of 127 qualifying defensive interior players. Lotulelei’s biggest threat to his future with team is Vernon Butler. Butler was often injured and played just 226 snaps as a rookie. 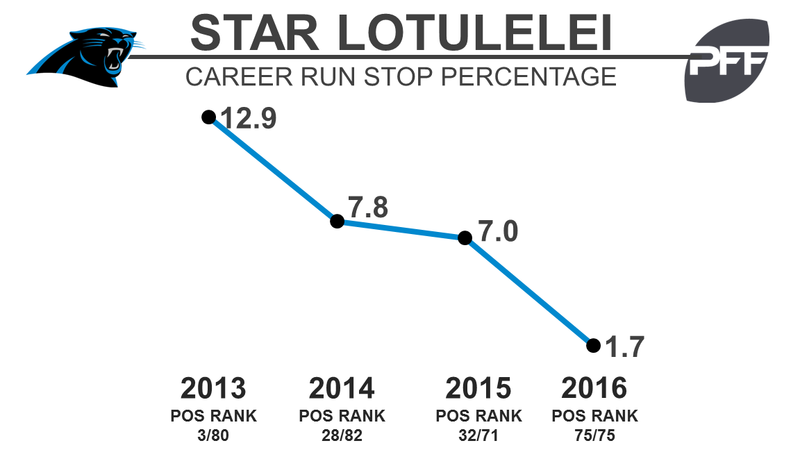 However, his 60.3 overall grade was moderately better than each of Lotulelei’s past two seasons.